We may only just be out of February, and the weather may not be improving much, but people are already looking ahead to spring and Easter. Easter eggs are already on supermarket shelves, the days are staying slightly lighter slightly longer, and people are already wondering whether they need to put their watches back or forward. 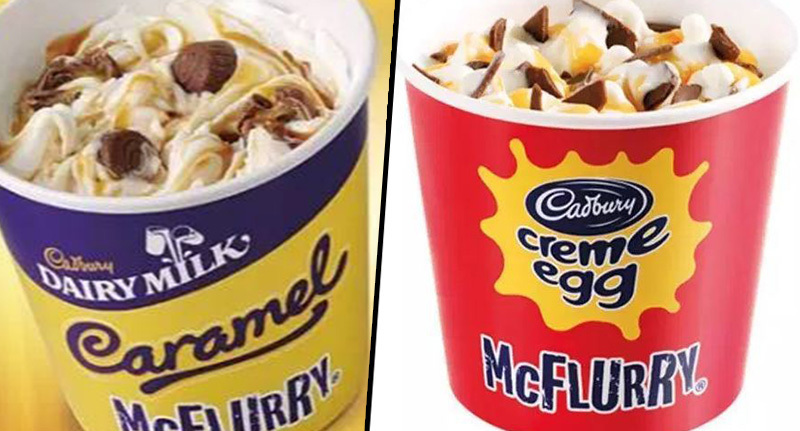 And to celebrate the Christian holiday, as is a now a time-honoured tradition, McDonald’s is bringing back their classic Creme Egg McFlurry and Cadbury Dairy Milk Caramel McFlurry. Because nothing says Easter like chocolate. Unfortunately, McDonald’s have upped the price slightly, with a regular 150g serving now costing £1.39 – 10p more than the limited edition flavours used to cost, according to hotukdeals.com. A regular McFlurry – such as the Oreo, Crunchie and Dairy Milk flavours – are still regularly priced at 59p for a mini and 89p for a regular, though prices can sometimes vary between different restaurants. Anyway, the two new flavours are going to replace the Twix McFlurry from March 20 – the same day the McDonald’s Monopoly officially starts so, y’know, that’s something to keep us entertained before March 29 at least. It’s the 17th year in a row the Creme Egg McFlurry is making an appearance at McDonald’s, becoming somewhat of an iconic, seasonal indulgence. Along with the delicious ice cream and Big Macs with or without bacon, you’ll also soon be able to win yourself some tasty treats at McDonald’s, thanks to the Monopoly game making a welcome return. To play, when you order any item there’ll be a little sticker attached to the packaging – on the side of your drinks cup, or on the burger box, for example. Simply peel off the sticker and see what you’ve won, or collect them for the chance to win one of the grander prizes. Up for grabs this year are MINI Cooper cars, Boohoo.com vouchers, and City Breaks from loveholiday, as well as cash prizes ranging from £5 to £100,000. Each meal used to come with two or three stickers, but this year McDonald’s have evened out the playing field by increasing the number of stickers provided for a medium Extra Value Meal, ensuring customers have the same opportunity to win regardless of their order size. As well as finding stickers on fries and burger boxes, for the first time customers will also receive them on carrot bags and side salads, as well as Big Flavour Wraps including the new Spicy Veggie One.